A large percentage of parents find four months old to be a difficult time period. For me, four months old was been a “golden age” for both Brayden and Kaitlyn, but a fussy time for Brinley. I have often wondered why so many parents find four months to be difficult (see 4 month sleep problems ). I have had my theories. While reading The Baby Whisperer Solves All Your Problems, Hogg lists many major changes that happen at four months of age (starting on page 33). 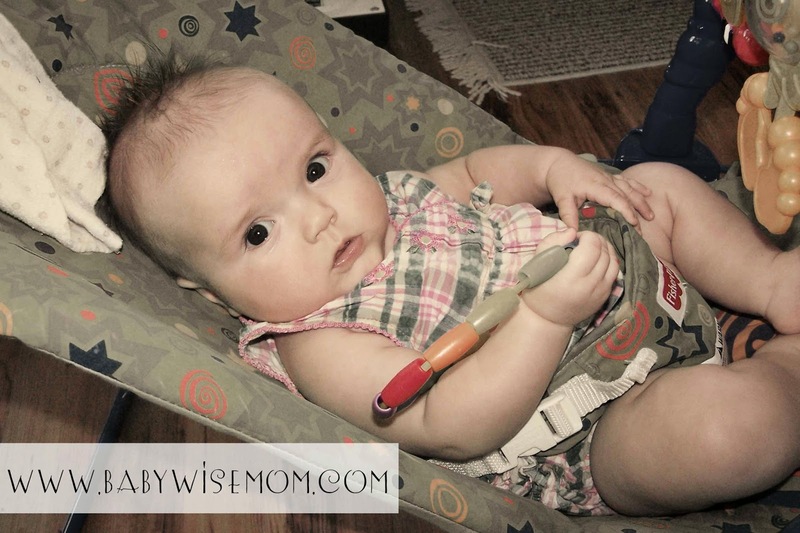 Hogg talks about how your baby is now more aware of her environment and more interactive. She engages with toys and has a better memory. She is a more efficient eater and nurses or finishes a bottle much faster. She can stay up longer than she could as a newborn. These are all things I have noticed (though both Brayden and Kaitlyn became much faster nursers around three months old). These are things that make four months really enjoyable for me. Longer Waketime: I listed this above, but if your baby needs a longer waketime and you are not recognizing that, you will have sleep problems. You will also have sleep problems if you see baby needs a longer waketime and add too much. When adding waketime, add very little at a time until you get to optimal. I personally added only 5 minutes at a time with Kaitlyn. That often was literally all she needed. I wouldn’t do more than 15 minutes at a time, but would actually stick closer to 10 if you think baby needs more than 5 additional minutes. See optimal waketime for guidance on figuring this out. i am in that 4 month stage and even though my baby has incredible changes i have experienced difficult changes. thanks for this. it’s nice to know i’m not just going crazy. it’s part of their growth. I am also in that stage and need some advice. I have 4 1/2 month old B/G twins. Both sleep fairly good at night, with a dreamfeed. I have several questions. I feel like I have gone back and read every applicable post but need some additional advice.1. I have been trying to extend from a 3 hour schedule for what seems like forever, but it’s not working. I’d like to drop that dreamfeed and move from 6 feedings to 5 per day, but need the last feeding to be later than 7 pm. But it’s like they are ready to eat like clockwork on the 3 hour schedule. Should I just keep it as it is?2. My daughter is consistently (pretty much EVERY nap) waking up at the 45 minute mark. I know she is waking herself up during those sleep transitions. How do I help her go back to sleep/learn how to soothe herself? I am hesitant to use CIO because I have noticed that if my son is also in that precious transitions period her crying wakes him up, which further wakes her up, and I have 2 crying babies instead of 1. If I try to give her the pacifier, she spits out and cries more. She then is awake early for the next feeding and then gets tired soon into the next waketime, which makes her next nap come sooner, which causes her to wake even earlier than the next feeding….and so on. As the day goes on, it just gets worse. IAny insight at all would be appreciated. The twins thing makes it difficult because they are just two totally separate personalities!! Thanks so much! Jenny,I’m a twin bw mom too! My boys are 8 1/2 months old, and I don’t know what I would have done without babywise. As far as extending the schedule goes, we did it very slowly. I did move my boys to a 3/3.5 hour combo schedule at around 5 months and that worked well for us. We ate at 8, 1130, 3, 6 and 830 (no nap between the last two). We started our day later than most do because of my husband’s work schedule, but you could try to do the same thing starting at your regular wake time. Believe me I know how wonderful dropping a feeding is. We just moved to 4 feedings, and it’s awesome! You’ll get there too, just hang in there! To help your babies extend their eating time, try letting them be up for 10 minutes or so before you feed them. That might help reset their 3 hour clock. Also, do you have a playpen your daughter could sleep in in another room for her hardest naps? I know Valerie suggests letting your baby sleep in different rooms sometimes to help them adjust for vacations and things. When one of my babies got a cranial band to fix his flat head, he had such a hard time falling asleep, and it would wake his brother. I had him sleep in the playpen in another room until he got used to it. That might work with helping your little girl learn to self soothe without disrupting her brother’s sleep. Good luck! I’m a little off topic here but am looking for some help. I have a 2 mo old and the 45 min intruder is killing our nap times. I’m working to put him back to sleep using shh/patt (using it for naps too since about 4-5 weeks when I starte EASY.) Do you have any posts on getting through this, how long it typically takes developmentally to learn how to sleep through it, other suggestions? I have a toddler which has made it harder to spend the time doing the shh/pat for both the put down and then after the 45 minutes. He literally wakes up to the minute most of the time! I’m not getting much me time since it takes him a bit to settle. Thanks CO Mum! We also live in a small house and the noise factor is a real problem given that I have 2 older children. I’ve burned my own CD and will give it a go tomorrow – thanks for the tip. I’d like to comment on the first point Val mentions – that 4MOs are more aware of their environment. I have found that at around this age, transfers between car/pram/bed do wake baby (unlike the sleepy newborns), and they are unable to finish out the nap without help. I have also found that naps longer than 45mins are extremely rare in the car or the pram at this age. This can (and has for my LO) create an unfortunate pattern of short naps when on the road during the day. This then leads to OT which makes naps at home harder for baby. I am currently working on this exact problem with my LO, and after tweaking my schedule to maximise nap opportunities on the road, I am now starting CIO for naps at home. Wish me luck!!! my baby struggled with the 45 min intruder… and i just gave it time. it happened for about two weeks. one thing i did was try to keep him up a little longer, so he was good and tired… about 10-15 mins longer. if he woke up early i would keep him in his crib as long as possible. even if he was awake. every baby is different. my personal belief is use bw or whatever method, but go with your guts. if you have a week where your baby is a little off, just keep trying and know that it will pass, especially if your baby started off as a good sleeper. my lo is now back to sleeping 1 1/2 – 2 hour naps. i just had to be patient with the changes. hope that helps someone. 1. If they are hungry at 3 hours, then you don't really have a choice but to feed them at 3 hours :). BW says not to rush the 4 hour schedule. You can try to hold them off by 10-15 minutes after they wake up so they get used to eating at longer intervals. But be sure if you extend the schedule that you don't also drop a feeding. You can drop the dreamfeed, but don't drop more than that until the dreamfeed has been gone for at least two weeks.2. First, be sure she isn't having a growth spurt. If she is hungry, she won't go back to sleep. If she is not hungry, do what you have to in order to get her used to sleeping through the transition. Some moms go in before the transition and pat baby as they are having it to help them sleep. Others will take baby and put her in a swing or bouncer when she wakes early. Others will rock, hold, etc. Thanks for your thoughts and tips Kristi! They are good ones. Leah, first, be sure it isn't a growth spurt. If it is, he will continue to wake early and request food. Once you are sure it isn't a food issue, then see the blog label "45 minute intruder" to the right. See also the blog label "waking early." Thanks CO Mom! That is great. Good luck Penny! That is the reason I run errands later in the day–so I don't throw the whole day off! Adrienne, that is a good tip. I agree; if they started off well (or were doing well), it might just be time that needs to happen to get back to good, no matter what else you try. It is hard for the parent though; you worry about starting bad habits and worry about the reasoning for the early waking. Question:4 month old babyOn a 7 to 7 scheduleSleeps 12 hours a nightBegan to break out of swaddle, have decided to drop it cold turkey.Background: large bruise on head when born so always slept on side or belly with bumpers. Can roll from tummy to back, but then is stuck.Problem: Morning nap has now gone from 2 hours to about an hour and a half.Afternoon nap: I have put her down a bit earlier because she has been fussy, but throughout the nap it seems she is moving a bunch like she isn't comfortable. This is the first time that I have watched her like a hawk on the monitor, so do babies move a lot?Do I go back to swaddling or just keep up the cold turkey?Could her morning nap just be getting shorter because she is sleeping so well at night? Kelly,There are always a lot of possibilities. A 1.5 hour nap is not too short, so it might just be what she needs. Babies do move a lot. If the sleep problems started at the same time you dropped the swaddle, you can try reswaddling and see if that improves things. The morning nap should not be shortening due to longer nighttime sleep. My daughter is 4 months old and we tried to ditch the swaddle on her sleepsack, but she was not ready, now a week later she is breaking out of it almost every nap.She is also waking up at 5 or 5:30 screaming for some reason. In the past she has slept from 7 to 6:30 or 7:00.We just started her on rice cereal at night only.Do we need to let her cry it out again? This is also happening for naps. She is down for about an hour and then wakes up screaming. She starts on her belly and then goes to her back. Dad Bradford,Try leaving one arm out of the swaddle at first.Did the screaming start with the introduction of rice cereal? If so, you might stop the cereal for a few days and see if that fixes it. She could be having a growth spurt and be hungry.Is she falling asleep before she moves to her back, or is she moving to her back mid-nap and that is waking her? I am happy to say that she naturally came out of her sack and is rolling from her tummy to her back either before she falls asleep or after she wakes up. I don't think it is waking her, but until she can figure out how to get back to her tummy it will be tough.Any suggestions? Val- I am SO frustrated!!! my LO sleeps on his tummy. he started turning himself over onto his back around 11 weeks. he was just doing it occasionally and it was waking him up/keeping him from falling asleep (b/c he HATES sleeping on his back), so we bought a sleep positioner to try to keep him from turning over. he is now 16.5 weeks old and his flipping over is CONSTANT, but he has yet to learn to go back to his tummy. it has totally messed up his sleeping. i want to keep this from being a terribly long post, so here are some of the highlights:-WAS STTN, starting at 7 weeks until around 13/14 weeks. NOW, wakes up every night, sometimes at the same time of night, sometimes not. have tried not feeding him, b/c i know he can make it thru, but it just lengthens the time we are awake. he won't go back to sleep until i feed him (BF baby, by the way).-WAS able to go down awake and put himself to sleep. WAS able to put himself back to sleep when he woke up during a nap. NOW will flip himself over if put down awake and will flip over if awoken during a nap. many times, he flips himself over in his sleep, then wakes up. -he will stay awake for a long time talking to himself and sucking thumb when on his back until he gets really tired (overtired) and can't get onto his tummy. even if i flip him over at that point, he's usually so overtired that he can't even CIO. he either won't fall asleep or just turns over and does it all over again.-is eating like crazy now. feeding every 2/2.5 hours, once in middle of night, and starting day around 6:30 or 7 now. -realize that this is prob. growth spurt and have read about the wonder weeks, so this could be that, too, since he's obviously trying to learn to roll back over. the problem is that it has been going on for about 3 weeks now! !-started cereal at night last night at 10 pm feeding. he woke up at 1:30 am!! !i don't know what to do! i have read all sorts of things on your blog. i have tried everything. i do awake time based on his sleep cues, so i don't feel like i am putting him down too early. any thoughts?? any other tummy-sleeper moms have this issue?? any help would be much appreciated. sorry this is so long. thanks!! Merran, pretty much all babies have that problem at some point. Tummy sleepers tend to experience it earlier than back sleepers because rolling front to back is easier than back to front. See this post for help on that:Nap Disruptions: Rolling, Standing, Crawling, etc: http://babywisemom.blogspot.com/2008/01/nap-disruptions-rolling-standing.htmlIf it is a growth spurt, the only way to stop it is to feed him as often as he needs it.I wouldn't feed cereal at 10 PM feeding. That should be a dreamfeed that involves as little waking as possible. Try it at a feeding during the day.If it is just becuase of a wonder week thing, there is nothing to do but ride it out. Good luck! Val,Thanks for getting back to me. I now know that lots of moms write you about this rolling over thing. I am sure you get tired of answering us! I appreciate you doing so anyway and LOVE your blog and am so grateful for it. THANKS! You are welcome! Hopefully it will help you out. Hey Val–would love your thoughts on my recent "issue"…:)My little girl is 20 weeks old and has been chronically waking early from her nighttime sleep for almost 4 weeks now. It started when we went to the beach for a week. We were in a cabin with her and she started waking between 4:30 and 5. (She has been sleeping a consistent 12 hours 700-700 for over 1.5 months). I would get her up, feed her off one side and then put her back down, and she would sleep to her desired waketime. That was on vacation. Then we get home and she comes down with her first cold that eventually turned into a sinus infection :(. So then she was waking again at 4:30-5:00, seemingly hungry and congested. And then came her 4 month shots..which seemed to not phase her (or were overwon by everything else!) Now, 4 weeks later, we're over the worst of the cold/sinus infection, back home, back on schedule, and still waking early. The last few days she's made it to 6 am, but that's it. I've waited it out, but she just lays there, talking, munching on her hands and eventually getting frustrated. I am trying to trouble shoot anything, and I can't seem to find the answer! She did do one 12 hour night Saturday and the only thing I can figure is she spent the whole day with me then (Mon-Fri she goes to a small in-home care with a friend of the family). Any ideas? Another thing—she is a chronic 45 min napper since she was 2 months, with longer naps sprinkled in here and there. I wonder if I need to talk with our friend who watches her to see if she can stick strictly to her schedule for a few days and see if it helps? She is usually within 30 minutes of her desired feeding time. Her *usual* schedule is:7:00 – Eat8:30 – Sleep10:00 – Eat11:45 – Sleep1:00 – Eat2:30 – Sleep4:00 – Eat5:30 – Sleep6:15 – Cereal6:30 – Bath, Bottle, BedAny suggestions would be great! I just really like her to get her full 12 hours as she is not such a great napper! Heather, you are welcome and thanks!What we did was stick to a 2.5 hour schedule with Brayden. He slept for about an hour, waketime was about 1.5 hour. There are potential problems for feeding every two hours. It can make it so he doesn't sleep well at night and can make so he snacks instead of eats. But if he is sleeping well, then you might not have anything to worry about.If it were me, though, I would shoot for 2.5 hour schedule. LindsayJay, my guess is that she will be disrupted from being at an in-home care. That seems to just throw most babies off.She was also at the wonder week age (see blog label "wonder weeks" for more). With all that was going on, I am guessing it would take her a while to get back on track. Hey there! I have an almost 4 month old little boy. I have tried a few times to get him on a specific schedule but it has been an overwhelming battle. At this point one would think he could easily be on a regular 3-3.5 hour schedule but when I wake him to feed before he wakes himself, he simply refuses to eat enough to get him to the next feeding because he is so tired. He then wakes early from hunger, will eat enough to take the edge off and then is too cranky and tired to eat enough to get to the next one. On average, he is still only getting 2.5-2.75 hour feedings – he's really all over the board. To give an example: he woke at 3am this morning, I pacified him until 4am and then he was too hungry to quiet back down so I fed him but then I had to wake him at 7am but he wasn't hungry enough to eat so he got about 1/2 a feeding. Sometimes he wakes at 3am, I push him to 4am but then he wakes hungry at 6am. Previously, he had been making it to 5/5:30am and I call it good for that morning because we have to start getting ready for work/the day at that point to get out the door on time. I'm quite confused and could use some advice 🙂 If you've already answered this, feel free to direct me. I've been scouring your blog but am confused about what would apply 🙂 Maybe, I just don't know how to get him through transitions! Hello!I have recently discovered your blog and it is extremely helpful! I have a few questions about my 4 1/2 month old and sleeping. A little background. Currently, she is on a 6:30/7, 10, 1, 4, 7 eating schedule. She is STTN from about 8-6/6:30. Her naps are all over the place anywhere from 35 min to 2 1/2 hours. We try to keep her awake time around 1 hr 40 min, unless we notice she gets tired sooner. If she takes a quick nap, then she is sometime up for an hour before her feeding, which means we have to put her down for a nap shortly after the bottle, and she is so fussy until she has that bottle, so it is no fun Currently, she is napping in the swing/stroller. She has slight reflux, but is only slightly fussy on some days, so we have not put her on meds as of yet. Her doctor does not seem to think she needs it. She sleeps pretty well at night in the crib, but not during the day. #1 She would try CIO in the crib for naps? I feel that the swing/stroller may not be giving her the greatest naps. She usually wakes 30 min and we have to go in and put the pacifier back (another issue to tackle)We did let her CIO 1x or 2x but she gets so worked up in the crib, her arms flail about and she is so restless. We recently broke her of the swaddle habit at night, so we don't want to do it during the day, # 2 We are at a loss with what do her with her after the 4:00PM feeding. She will sometimes take a quick (45 min) nap from around 5:30-6:15 and then feed at 7, but I am alway worried she won't be tired for her 8 Pm bedtime. If she doesn't nap at that time, then she is up from at least 4 (sometimes 3:30) until 8 PM which I think is too long for a 4 1/2 month old. When do babies drop this late afternoon/early evening nap? #3 When she wakes up in the morning, she is tossing a lot, but her eyes are closed. You can tell she is still tired, but her body seems to be fighting staying asleep. Is it hunger? She eats around 12 hours before, which I think is normal. Just wish we could have her sleep a little later until 7. Thanks so much! Chantel,In the night, if you are going to feed him anyway, I would just feed him right away. The only thing I would consider doing is holding him off for 15 minutes in hopes he would be able to go another 15 minutes the next night. But him being up for an hour in the night I am sure is interfering with his daytime.Are you caring for him in the day while you work? If not, there might be inconsistencies with his days that are throwing him off.Also, since you say you wake him and he doesn't eat, maybe he would do well on a 4 hour schedule. Allieyanks,You are right that naps in a swing are not as good as naps in a crib. But with the reflux I would be hesitant to suggest CIO.Most babies go to 3 naps a day at 4 months,but if she has short naps all day she might need a fourth.Good luck! I have 17 week old who is almost 17lbs and getting 8 oz every fourhours. I have to push her to 4 hours every time. The last feedingis at 7 pm but she can barely make it and cries from the end to herbath until she eats. I have read that I should read her a book before bed but she cries from when she wakes up from her nap until she eats and immediately falls asleep for the night.She falls asleep during the feeding and sleeps until 3 or 4 and falls asleep after i give her the pacifier and then wakes up every 45 minutes from 5 until 7 when I feed her. She is getting enough to eat so I am not sure what to do to make it the day and night easier for both of us. She naps only in her swing from 9 until 10:30, 1 until 2:30 and 4:30 until 6 but cries from 6 until she eats. She sleeps fine in her crib at night but won't during the day. Should I change her feeding schedule or oz? Should I let her CIO at night? KK, so far as reading a book, you can read anytime of day. Before bedtime is a great time to get to at some point–it makesa nice bedtime routine. But you can wait until that works better for your baby.At night, since she wakes every 45 minutes, I would say she is hungry. It looks like you are keeping her up too long in the day. She should be awake between 1-1.5 hours, including feeding, and it looks like she is up 2-2.5 hours at a time. With a shorter waketime, she will sleep better for naps.I would not do a four hour schedule at this point. She isn't able to sleep until the nex feeding, so she isn't ready for the four hour.